This salad is easy, delicious and filling. Often I find that lettuce remains in the crisper drawer in the refrigerator for far to long after my farm share delivery – a sure sign I’m not eating enough salad. When I found out that I was getting radicchio and romaine lettuce in my share, I made it a priority to use it first. This salad is the result. I made it a few weeks ago and forgot to post- so my apologies for not providing exact measurements. 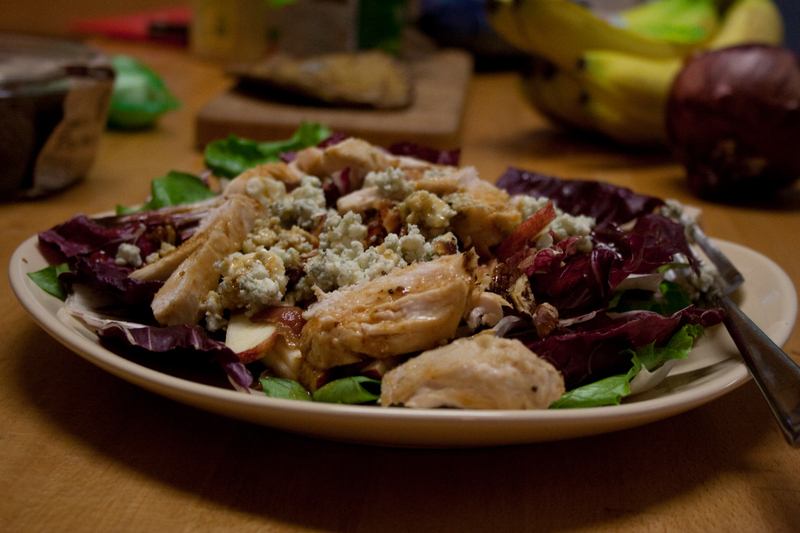 Salad: Top washed and dried radicchio and romaine lettuce with toasted chopped pecans, apple slices, crumbled blue cheese and grilled chicken. Dressing: Cook 4 slices of bacon in a frying pan. Remove bacon and crumble on top of salad. Deglaze pan with several tablespoons of apple cider vinegar. Add freshly ground cracked pepper. Drizzle on top of salad and enjoy!